aqueous solutions, particulate analysis and microbiological analysis. Mixed Cellulose Ester (MCE) - Biologically inert mixtures of cellulose acetate and cellulose nitrate result in membranes with a smoother and more uniform surface than pure nitrocellulose. Easy to handle, less cracking and fracturing than traditional CN membranes. A pure surface with no additional smoothing treatment or surfactants. Nitrocellulose (NC) - 100% pure nitrocellulose membranes ensure the highest binding capacity possible and are commonly used for nucleic acid and protein detection in research and diagnostic applications. Polyethersulfone (PES) – The PES membrane is hydrophilic which does not require external wetting agents or surfactants. Polytetrafluoroethylene (PTFE) – Our unsupported porous PTFE material is equivalent to most of the leading suppliers of specialty analytical membranes. These membranes demonstrate exceptional physical characteristics, consistent pore size, high particle retention, high load rates and excellent flow rates. The incredibly high cellular pore structure is attributed to the techniques involved in manufacturing the material, providing a continuous, uniform homogenous structure. I.W. Tremont offers a diverse range of specialty products to help you meet your specific testing and application requirements. All of our products are manufactured to the highest standards in the industry and are supported with our technical expertise and superior customer service. MB-2051 Petri dishes 55mm diameter w/cellulose pad sterilized by Gamma radiation. x 100 units. 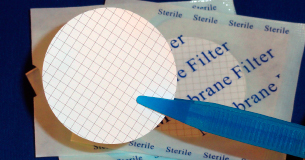 Our unsupported porous PTFE material is equivalent to most of the leading suppliers of specialty analytical membranes. These membranes demonstrate exceptional physical characteristics, consistent pore size, high particle retention, high load rates and excellent flow rates. The incredibly high cellular pore structure are attributed to the techniques involved in manufacturing the material, providing a continuous, uniform homogeneous structure.